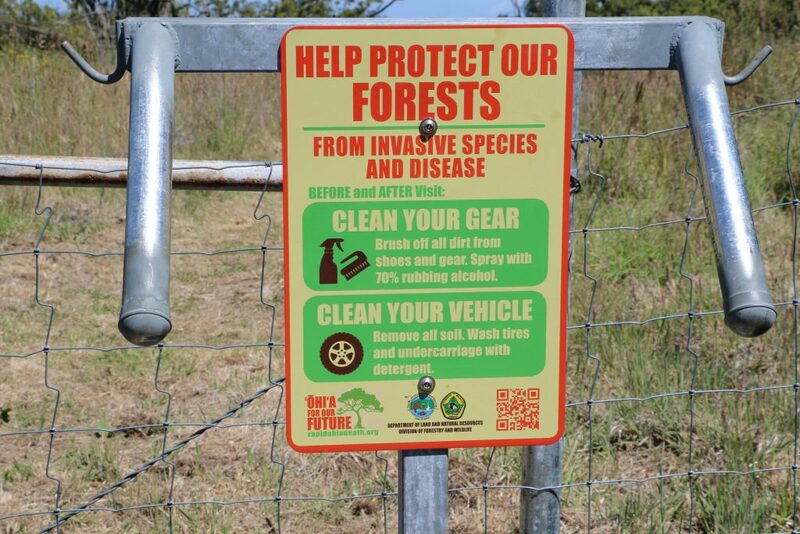 These signs will be installed on Department of Hawaiian Homelands (DHHL) property behind Anahola Mountain where Ceratocystis lukuohia, the more aggressive of the two diseases, was detected in three trees last December. Since then, 11 more trees have tested positive for C. lukuohia and 15 have tested positive for the second type of pathogen causing ROD, Ceratocystis huliohia. “We appreciate the diligent work by the DLNR and the other agencies on this issue. We ask that all DHHL beneficiaries and the public be attentive to these warning signs and continue to mālama ʻāina by following their guidelines,” said Jobie Masagatani, Hawaiian Homes Commission Chairman. STAY ON ESTABLISHED TRAILS to stop ROD’s spread. AVOID INJURING ‘ŌHI‘A. Do not blaze trails. Avoid stepping on roots. Do not cut ‘ōhi‘a limbs. CLEAN SHOES & BOOTS. Brush off soil and spray with 70% rubbing alcohol or freshly mixed 10% bleach solution. PRESSURE WASH off-road vehicles to remove any dirt before entering forest areas. WASH GEAR AND CLOTHING in hot soapy water. Eventually, these signs will be available for posting in all locations where ROD has been discovered. In addition to the Anahola site, this includes Moloa‘a State Forest Reserve and privately-owned land in Halele‘a Moku and near the Līhu‘e-Kōloa Forest Reserve. These four distinct locations range in elevation from 550 to 1,600 feet above sea level. In full support of spreading the message about Rapid ‘Ōhi‘a Death, Hawai‘i Tourism has provided funds for signage and boot-brush stations. Eventually, boot-brush stations will be installed at many of these same trailheads. The microscopic fungal pathogens that infect ‘ōhi’a with ROD can be spread in soil that sticks to footwear, gear, and tires: truck, mountain bike, or motorcycle. Removing dirt can reduce the possible spread. A second step that’s also important to help reduce the spread is to spray footwear, gear, and tires with 70% rubbing alcohol (or a freshly-mixed 10 percent bleach solution). Clothing should be washed with hot soapy water and, if possible, dried in a dryer. Temperatures exceeding 140 degrees Fahrenheit will kill the active spores. Freezing will not. At the site where C. lukuohia has been confirmed, three trees with frass (a sawdust-like material created by Ambrosia beetles) tested positive for the live fungal spores that cause ROD. These boring beetles are attracted to dead and dying trees. If they bore into the sapwood of an ‘ōhi’a where the deadly fungal spores grow, they can provide a way for the live spores to enter the environment and infect other ‘ōhi’a. A multi-agency working group continues to respond to ROD developments on Kaua‘i by conducting regular island-wide aerial surveys to identify suspect trees, on-the-ground tree sampling, management activities to contain the spread of ROD, and outreach to educate residents and visitors on how to prevent ROD’s spread. In the past few months, outreach efforts have intensified with the creation and distribution of Kaua‘i-specific brochures, flyers, and other educational materials. As well, Hawai‘i Tourism has sponsored workshops on bio-sanitation practices for eco-tourism operators and conservation-minded groups. The documentary, “Saving ‘Ōhi’a” has screened in numerous public venues. Community and school groups interested in screening this documentary and learning more about Rapid ‘Ōhi’a Death are encouraged to email saveohia@hawaii.edu. Kama‘aina are also encouraged to keep their eyes open and report the sudden browning of an ‘ōhi‘a’s leaves to KISC via email (saveohia@hawaii.edu) or phone (808-821-1490). Samples of the wood must be taken by trained technicians and tested in a laboratory to confirm the presence of the ROD fungi. Kaua’i’s rapid response team includes scientists and managers from DLNR/DOFAW, KISC, The Nature Conservancy, National Tropical Botanical Garden, Kaua‘i Watershed Alliance, U.S. Fish and Wildlife Service, and the University of Hawai‘i.